(CNN) -- South Carolina Gov. Mark Sanford admitted Wednesday, amid speculation over his whereabouts for the last several days, that he has been engaged in an extramarital affair with an Argentinian woman. 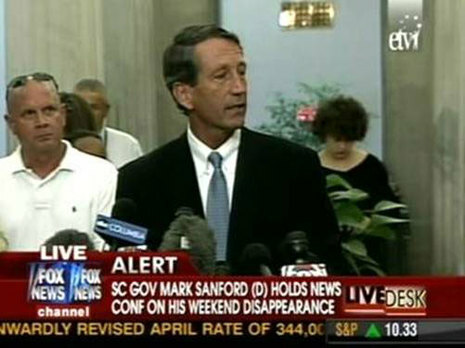 "I've been unfaithful to my wife," Sanford told a news conference in Columbia, the state capital. "I developed a relationship with what started as a dear, dear friend from Argentina." His voice choking at times, Sanford apologized to his wife and four sons, his staff and supporters, and said he would resign immediately as head of the Republican Governors Association. The affair was discovered five months ago, Sanford said. The South Carolina governor had not been seen in public since June 18. When questioned, Sanford's staff had told media outlets that he was hiking in the Appalachian Trail. But Sanford was spotted Wednesday in Atlanta's Hartsfield-Jackson International Airport. Mark Sanford, the governor of South Carolina, said he had conducted an extra-marital affair with a woman in Argentina, ending a mystery over his week-long disappearance that had infuriated lawmakers and seemed to put his rising political career in jeopardy. He apologized for the affair and the deception surrounding his trip in a rambling, nationally televised news conference Wednesday afternoon. Governor Sanford, 49, admitted that he had been in Buenos Aires since Thursday, not hiking on the Appalachian Trail as his staff had told reporters. Mr. Sanford announced on Wednesday that as a result, he was resigning his position as chairman of the Republican Governors Association.